Google's AI Experiments are fun showcases for feats of artificial intelligence the company's research has enabled. 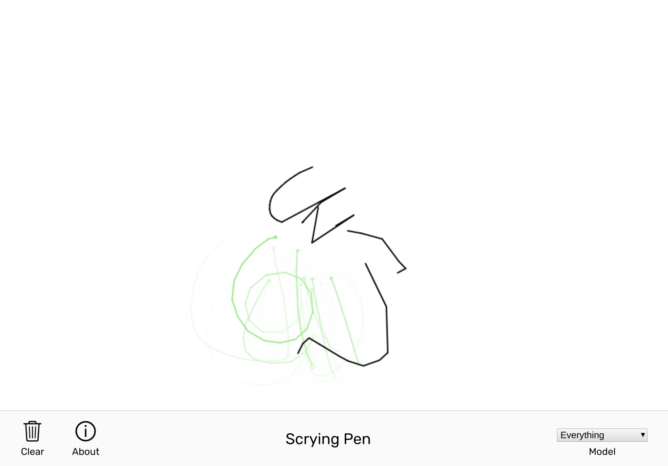 Scrying Pen is a new one that uses algorithms trained by data from 2016's Quick, Draw! experiment to show a path to draw one of a set of objects, like a cat or a hand. Scrying Pen analyzes your inputs to try to predict what you'll draw next in the context of the model you've selected, displaying a number of its best guesses as to your next moves as green lines. There are more than a hundred trained models to draw, ranging from the expected—cat, dog, truck—to the absurd, like "antyoga," "radioface," and "everything." The "everything" model seems to predict random line placement. The experiment was created by Andy Matuschak based on sketch-rnn, a neural network Google trained "on millions of doodles collected from the Quick, Draw! game." Results are a mixed bag; trying to draw with a mouse or your finger on a screen is tricky enough, let alone trying to follow an AI's instructions while doing it. Still, it's fun to see an artificial intelligence's "thought process."